While connecting to Network in your Android device many users are facing an Error which shows a message “Obtaining IP address” which can be seen for a while without getting any solution for the problem. This error was seen when a user was trying to turn on and connect to Wi-Fi. There are many solutions on the internet which are suggesting downloading apps to solve the problem but most of these apps are not providing any solution. 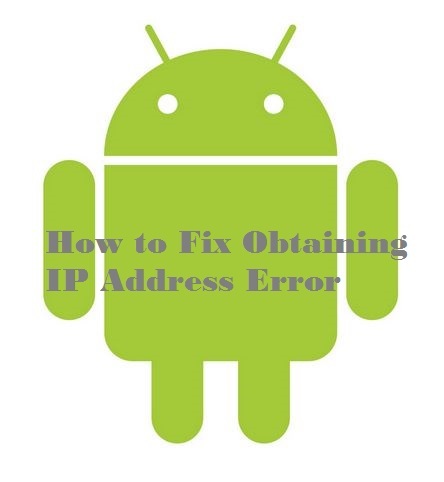 The Error is seen when your android device tries to scan and connect to the network and obtains IP address which is not able to be accessed by the device and the procedure is repeated once again trying to obtain the IP address and you then get the Error Obtaining IP Address. According to a Forum this can be caused due to the Wi-Fi router that is not able to assign IP address to your Android Device. These steps can be used without the use of any Apps but by just altering the settings on your device. Tap on Settings App on your Home Screen. Tap on the Wireless and Networks option to access it. Make sure to Turn on Wi-Fi and then tap on Wi-Fi settings. Now access Menu by tapping on it and then select Advance options. Check on Use Static IP and enter the details mentioned in the post below. Proxy – None, IP settings: Static, IP address, Gateway and other settings will already be present or you can change them accordingly. Tap on Settings and then select Wi-Fi option. Make sure to Turn on the Wi-Fi and connect to a network. Now you have to Long press on the connected network and then tap on Modify Network. From the list of options select Advance Options by tapping on it. Now in the IP address option you have to enter the IP address of your choice but leave other options unchanged and save the settings. These steps have proved helpful for many users and i my self could solve the Obtaining IP address error. Do not download and Install any application which promises to solve this error all of which were found useless. When i turn on wifi and savw the IP adress. It could not be saved. So i cant connect to wifi. Is there any solution for that. One can set the static ip address for one wifi connection. But how do you solve the the general wifi connectivity problem with one static ip address? Does it have any solution n DHCP mode of ip address?